Monza: Well, I have never seen that before have been watching Grand Prix racing pretty regularly since 1948 and this was the first time I had seen a Grand Prix starting grid without a front row! Even more bizarre, the pole-position driver was at the back of the grid and the reigning World Champion was sitting in his spare car in the pit lane. All that, and the red light was on, with the green imminent, to start the 57th Italian Grand Prix at Monza. The red light went out, the green came on and the 26 starters on the grid surged forward. In less than 100 yards the black and gold Lotus of Ayrton Senna suddenly slowed dramatically as the clutch gave out and he came to rest with cars passing him on both sides, while the razor-sharp reflexes of his fellow Formula 1 drivers prevented him being hit up the back as he sat in his Lotus, with his arm raised. When the regulatory fire-prevention cars and the doctor's car had gone by, Alain Prost was unleashed from the pit road and set off in hot pursuit, while Senna managed to make his Lotus drag itself off the track to the right, where he parked it and retired. It was interesting that in the turmoil of being stranded in the middle of the track, with cars whizzing by on both sides, he had kept the Renault turbocharged engine running, until it was clear for him to turn right and limp away with just sufficient friction in the clutch to move slowly. Many people thought a drive-shaft had broken, or a drive-shaft joint, or even a gearbox shaft, but it turned out to be a simple matter of the clutch. 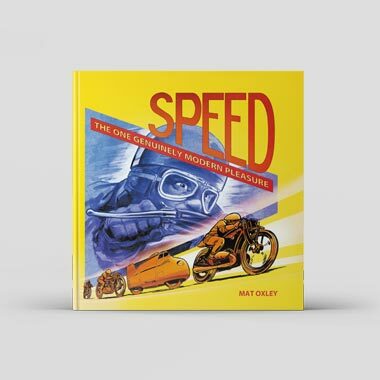 He had sensed trouble as he slipped the car into gear when the red light came on, indicating four to seven seconds before the green light would shine, because the clutch began to drag and he had had to give a dab on the brake pedal to stop creeping forward. So what caused this most unusual scene at the start of the Italian Grand Prix? Practice and qualifying had not gone too well on Friday, mainly due to many engines blowing up and coating the circuit with oil, but Saturday improved, though not for everyone. The Italian crowd had felt cheated on Friday because Alboreto had not appeared, and while they love Johansson, Michele Alboreto in car number 27 is their real favourite. "Albert" had had a slight accident on his motorcycle and had fallen off and hurt his shoulder, so he was resting, but he was back on the scene on Saturday, though the partisan crowd was rather small by Monza standards. Throughout the day the tempo was very slow and there seemed to be none of the usual urgency about the afternoon qualifying hour. It was as if everyone was merely going through the motions of Formula 1, without much enthusiasm. For those of us close to the scene the pace of the BMW-powered Benettons, driven by Fabi and Berger, is something we have become used to, so when they started topping the lists the "pit lane habitués" took it in their stride. For the Italian public it was totally alien. Ever optimistic, the Monza crowd expects a Ferrari to be on pole position and, if it is a real "joy day", it would be driven by an Italian driver, and they would cheer their heads off in sheer delight. With Teo Fabi on pole position, driving a Benetton powered by a BMW engine with the car painted basically green and white, there was a bit of a deadly hush when it was announced. "But Fabi is Italian," you might say. "Bleah." "Well, Mr Luciano Benetton and his brothers are Italian," you could add. "Bleah." "But it was running on Pirelli tyres, and they are Italian: you could offer, hopefully. "Bleah." 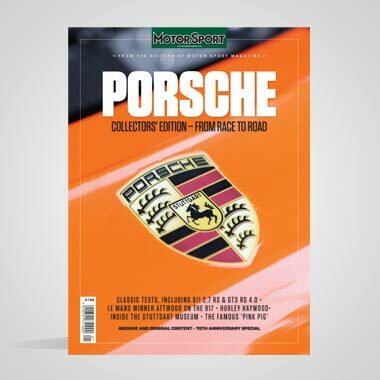 There is no point in mentioning the German BMW engine or the non-Italian designer, team manager, mechanics or the English factory where the cars are built. 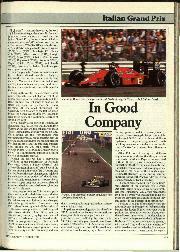 "Well anyway, Alboreto is well enough to take part in the race." "Hurrah, Hurrah, Hurrah . ." "And the Ferraris were pretty fast through the speed traps," you might add. "But of course," would be the reply. I love Italian enthusiasts, they are so uncomplicated. They have a simple outlook in which racing cars are red; red cars are Ferraris; Ferraris are the best. "So what's the problem"? The problem was that Fabi was on pole position with one of the BMW-powered Benettons. Rory Byrne and his team were really chuffed, and the Benetton family was more than able to justify all the time, money and effort it had put into the team since buying it from Ted Toleman. 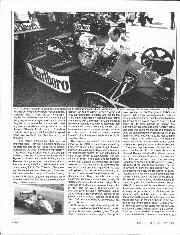 Five years ago the sarne basic team, financed by Toleman, had made a cautious entry into Formula 1, using a Brian Hart engine in Rory Byrne's chassis and they just managed to qualify one car for the Monza grid. Brian Henton was at the back of the starting grid with a Toleman-Hart, and the team were overjoyed as they felt they had made their first real step forward. That was Monza 1981. 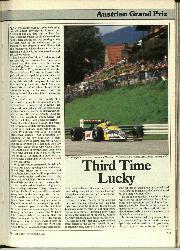 Now we were at Monza 1986 and their car was on pole position. It had not been an easy transition, but it was well worth all the blood, sweat and tears. There was a new entry for this race, in the shape of the AGS, a small team owned by Frenchman Henri Julien, with a straight-forward Formula One car powered by a Motori-Moderni V6 turbocharged engine, as used in the Minardi cars. It was driven by Ivan Capelli, who has driven for Tyrrell in the past, and he qualified comfortably, ahead of the two Osellas, as would be expected. 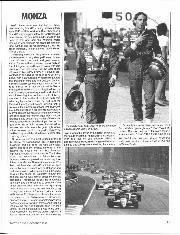 This meant that the second Osella was in 27th place and thus unqualified, the rules limiting the starting grid to 26 cars. Normally the second Osella would have been driven by Canadian Alan Berg, but this time young Alessandro Caffi was at the wheel, having his first taste of Formula 1 and really enjoying it. Now Enzo Osella has long been a stalwart supporter of FISA and the World Championship, so everyone (even McLaren International) rallied round and agreed to waive the 26-car rule; so the Stewards sanctioned 27 cars for the race and "Alex" Caffi was able to line up at the back of the grid on his own. All 27 cars assembled on the "dummy-grid" on the impressive Monza start-finish straight and in due time the 5 minute signal was given. The grid started to clear and engines began to fire up. On pole position the BMW engine in Fabi's car needed quite a lot of cranking with the portable air-starter before it fired, and the official with the green flag held it poised ready to send the field away on its slow parade-lap behind the Benetton. On the other side of the front row of the grid there was panic. Mechanics and engineers were still gathered round Prost's McLaren and a start-line official was waving to the man with the green flag to hold everything. The Porsche engine would fire and then die as the "slave" battery was unplugged from the electrical circuit. The green flag was waved, Fabi moved forward a few feet and then his engine died and he stopped! The rest of the field had started to move forward and cautiously threaded their way past the stationary McLaren and the stationary Benetton, all conscious that they were breaking the rules of the parade lap because you are supposed to follow the pole position car. The Benetton mechanics rushed to their car and got it restarted and Fabi went away knowing he was going to have to stay at the back of the grid, for the rules do not allow you to regain your position once the green flag has been waved. Meanwhile, Prost leapt out of his car and ran across to the pit lane where the spare McLaren was sitting all ready to go, such is the efficiency of the McLaren team, but he knew that the rules demanded that he stay in the pit-lane exit until the whole field had left the start, though in the flap no-one had remembered Article 13, paragraph 3, in the rule book, which states that you can only change cars before the green flag is waved. Even the pit lane marshal had forgotten that one. 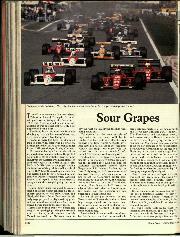 The depleted field returned at the end of its parade lap, and Mansell and Berger were not the front row of the grid, though they sensibly did not attempt to move up beyond their marks which formed the second row, so there we were with the Italian Grand Prix about to start, and no front row on the grid. Young Caffi, sitting happily on the back row in his first Grand Prix must have wondered what was happening when he found Teo Fabi keeping him company, and up at the front Mansell and Berger knew that the lead was now theirs, unless Senna got the jump on them from row three, but as we know, that didn't happen. The reigning World Champion took off from the pit lane like a good 'un and we sat back to see what sort of stuff he was really made of, for this was a "moment of truth". 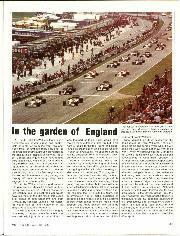 By the end of the opening lap he had caught and passed Caffi and Rothengatter, and with Senna already out, he was 24th. On lap 2 he passed Capelli and Ghinzani, 22nd. On lap 3 he passed Danner, Nannini and Palmer, and with Tambay and Patrese retiring, he was 17th. Lap 4, and he passed Streiff and de Cesaris, 15th. Lap 5, he passed Brundle. Lap 6, he passed Boutsen. Lap 8, he passed Alan Jones; he was now 12th. Lap 9, he passed Alliot. Lap 10, he passed Warwick. Lap 11, he passed Dumfries, and now he had caught Fabi who had started 26th but with a flying start over Prost. On lap 14 Prost passed Fabi. He was now 8th and in sight of the front-runners. Alboreto stopped at the pits, which promoted Prost another place, and then he passed Arnoux on lap 18, and his own team-mate, Rosberg, on lap 21. He was now fifth. It was real World Championship driving without any question. Three of his laps had been under 1 minute 30 seconds, while the best anyone else had done was 1 minute 31 seconds. At the end of lap 22 Prost was seen heading for the pit lane not only for a tyre change but to have the nose cone replaced as he had taken the right-front fin off as he had bounced over a kerb in his hurry. The stop was a long one by Formula 1 standards, and he rejoined the race in 11th place, but he was soon back on his pace, then two officials appeared on the edge of the track, one with a board carrying the number 1, and the other with a black flag. This meant that number 1 car had to pull into the pit-lane next time round, Prost went by seemingly unmoved and he appeared up the final straight clearly not heading for the pits, but there was smoke issuing from the back of the McLaren. 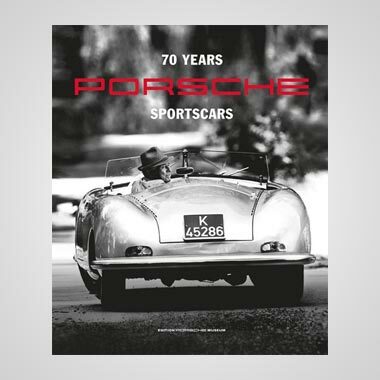 The engine was dead and he coasted past the black flag and number board and pulled off to the side of the track; the Porsche engine had failed. 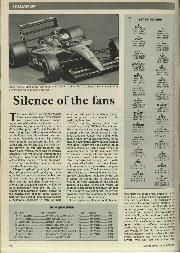 It subsequently turned out that the black flag indicated that Prost was being disqualified for infringing Article 13 (3), and it had taken the stewards rather a long time to arrive at their decision. 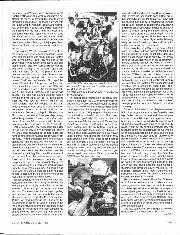 There was a lot of shouting and yelling and acrimonious interviews with the media afterwards, which resulted in Prost being fined $5,000 for "bad-mouthing" the FISA and the organisation of the Italian Grand Prix, but in the "hoo-hah" everyone seemed to lose sight of the fact that he retired from the race because his engine blew up. The black flag, was purely a paperwork technicality that had no bearing on his retirement from the race, after a fine display of hard driving. For those people interested in the actual race, Berger once again led a Grand Prix (he will win one eventually) only to be delayed, first by a front brake duct breaking away and getting lodged in the suspension, this dropping him back to 4th place and in the closing stages, suffering frorn a bad misfire that robbed him of most of his power, so that he gradually fell back to an unrepresentative 5th place at the end. Mansell and Piquet had followed the Benetton while it had been leading, and the crafty little Piquet had followed his English team-mate with that sort of relaxed ease that suggested he had everything under control. You appreciate this when they start lapping slower cars. If the second man is only just hanging on to the leader, he has to indulge in all sorts of dicey manoeuvres to avoid being left behind, as it only needs one hesitant move in following-through into a corner and you cannot regain your station. When you see the second man taking his time about lapping slower cars, so that the leader gets away a little, but is then immediately caught again, you know that the second man has got everything well under control, and Piquet had it exactly that way. I have a simple outlook on Grand Prix racing and put it down to Piquet being the better driver, but Mansell fans argue that, "Poor Nigel had this wrong, or that wrong, and Piquet had better this or that, and it was all unfair." I get tired of listening really, as I am a Piquet supporter and that is the end of it as far as I am concerned. After a slow tyre stop Piquet was back in third place, while Mansell was away in the lead, but the gap began to close relentlessly and you knew Nelson Piquet was on his way. There was no need to put a stop-watch on the gap between the two Williams-Hondas, the reducing gap was visible each time round and Piquet went into the lead on lap 38. He got comfortably ahead of Mansell and then eased off to set the pace and the two Williams-Hondas cruised home to another impressive first and second. And to think that a rather self-important Fleet Street Sunday journalist forecast that the Williams team would crumble into a shambles when poor Frank Williams suffered that awful car accident back in the winter. If anything, the temporary loss of the "Boss" seems to have inspired the whole Frank Williams empire to even greater things than they were anticipating, and it has all been the best therapy possible to assist Frank in his slow recovery. But what of the Italian crowd, large as always, but not as large as normal when Ferrari is on a high. "Albert" saved the day initially by driving an inspired race, a bit rough and ragged at times, bouncing over kerbs with daylight under the front wheels, but nevertheless hanging on to a fine 4th place. A spin out of one of the chicanes saw him brush the guard-rail and damage the two wheels on one side necessitating an early pit-stop, but he climbed his way back up to 5th place only to have the engine fail. Meanwhile, Stefan Johansson had moved up from 8th place on the opening lap, to 5th place and took over when Alboreto made his mistake. There was no way he could match the Williams-Honda team, but he drove hard and fast and brought cries of by from the crowd when he took third place from the ailing Berger in the closing stages, thus getting himself up on the all-important winner's podium at the end of the race, and the Italians loved him for it. "Stefano" had saved the day for Maranello. The dreaded "pericolo giallo" had triumphed, but Ferrari was up there on the podium at the end, which is what really mattered. The International Nelson Piquet Fan Club was out in force once the race had finished and the swarthy Brazilian was overjoyed with his victory and his reception by the crowd, the clapping and cheering being very strong. Eventually the loud speakers played the Brazilian national anthem and it was rather touching to see Nelson Piquet put a finger to his lips, to indicate to the adulating crowd to stop their cheering while his National Anthem was played.